QUETTA, PAKISTAN: There has been another deadly attack on an election rally in the country. Pakistan's Blouchistan candidate of party Suraj Hassani was among those who were killed in the blast. Keeping glamour and glitz away, this the reality of Pakistan as this has been another deadly blast. The fatal suicide blast targets a political rally in Pakistan. The IS group says it carried out the attack which killed many people in Quetta. 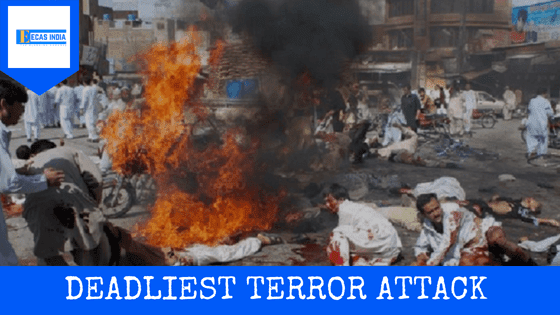 This claimed to be the deadliest terror attack in Pakistan since 2014. Two political candidates have already been killed in the last two blasts following this month, just before the General Elections in the country. These situations can be questioned as per the political aspect. At least 133 people have been killed, including a parliamentary candidate, and more than 230 wounded in two separate election-related bombings in Pakistan on July 13, authorities say, amid growing tensions over the return and arrest of ousted Prime Minister Nawaz Sharif who is facing corruption charges. Pakistani police said a suicide bomber struck a campaign convoy near the southwestern city of Quetta, the capital of Balochistan Province, killing at least 128 people, including Siraj Raisani, a candidate running in the July 25 general elections. At least 200 people were wounded in that attack, which was claimed by the Islamic State (IS) terror group. Home Secretary Haider Ali Shikoh confirmed that Raisani, who was a member of the Balochistan Awami Party, had died. IS claimed responsibility for the attack in an announcement by the militant group's Amaq news agency. Earlier in the day, five people were killed and at least 32 were wounded in a bomb blast targeting another candidate. No one claimed responsibility for that attack. The blast targeted a convoy transporting former Housing and Works Minister Akram Khan Durrani, who escaped unharmed, local police chief Khurram Rashid said. Every country should conduct its own reforms, should develop its own model, taking into account the experience of other countries, whether close neighbors or far away countries. We must love our neighbors as we love ourselves. I believe "Leadership is any country is not about the next election, it's about the next generation".